On July 17, 2009, between 17:00 and 18:00, Rozalie Hirs is interviewed for the program Culture Magazine La Dolce Vita on the Belgian national radio channel Radio Klara. In this radio portrait she talks about recent work, she recites poems, and her music is broadcast. 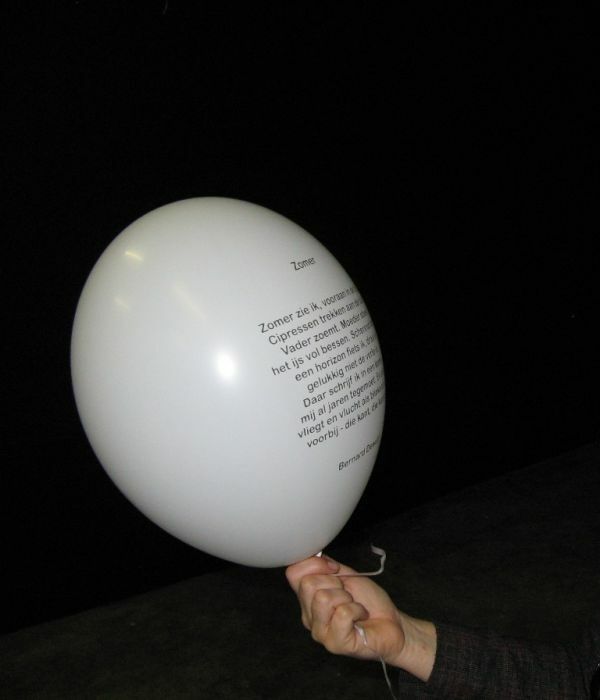 On July 2, 2009, the arts festival Watou opens with an installation of helium balloons, on which poems have been printed by the following poets: Bart Moeyart, Roland Jooris, Joke van Leeuwen, Leonard Nolens, Bart Meuleman and Rozalie Hirs. The poem ‘Wereld van nu’ by Rozalie forms part of the installation and has been integrated into the exposition, which is on display from July 2 to September 6, 2009.